BEIRUT (AP) — A suicide bomb ripped through a mosque in the heart of the Syrian capital Thursday, killing a top Sunni Muslim preacher and outspoken supporter of President Bashar Assad in one of the most stunning assassinations of Syria’s 2-year-old civil war. At least 41 others were killed and more than 84 wounded. The slaying of Sheikh Mohammad Said Ramadan al-Buti removes one of the few remaining pillars of support for Assad among the majority Sunni sect that has risen up against him. It also marks a new low in the Syrian civil war: While suicide bombings blamed on Islamic extremists fighting with the rebels have become common, Thursday’s attack was the first time a suicide bomber detonated his explosives inside a mosque. A prolific writer whose sermons were regularly broadcast on TV, the 84-year-old al-Buti was killed while giving a religious lesson to students at the Eman Mosque in the central Mazraa district of Damascus. The most senior religious figure to be killed in Syria’s civil war, his assassination was a major blow to Syria’s embattled leader, who is fighting mainly Sunni rebels seeking his ouster. Al-Buti has been a vocal supporter of the regime since the early days of Assad’s father and predecessor, the late President Hafez Assad, providing Sunni cover and legitimacy to their rule. Sunnis are the majority sect in Syria while Assad is from the minority Alawite sect — an offshoot of Shiite Islam. “The blood of Sheik al-Buti will be a fire that ignites all the world,” said Grand Mufti Ahmad Badreddine Hassoun, the country’s top state-appointed Sunni Muslim cleric and an Assad loyalist. Syrian TV showed footage of wounded people and bodies with severed limbs on the mosque’s blood-stained floor, and later, corpses covered in white body bags lined up in rows. Sirens wailed through the capital as ambulances rushed to the scene of the explosion, which was sealed off by the military. Among those killed was al-Buti’s grandson, the TV said. The bombing was among the most serious security breaches in the capital. An attack in July that targeted a high-level government crisis meeting killed four top regime officials, including Assad’s brother-in-law and the defense minister. Last month, a car bomb that struck in the same area, which houses the headquarters of Syria’s ruling Baath party, killed at least 53 people and wounded more than 200 others in one of the deadliest Damascus bombings of the civil war. A small, frail man, al-Buti was well known in the Arab world as a religious scholar and longtime imam at the eighth-century Omayyad Mosque, a Damascus landmark. State TV said he has written 60 books and religious publications. 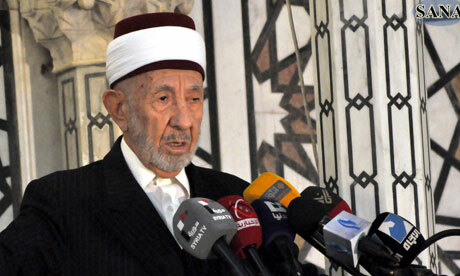 In recent months, Syrian TV has carried al-Buti’s sermons from mosques in Damascus live every week. He also has a regular religious TV program. Among the opposition, there was a mixture of suspicion and shock that an elderly religious figure such as al-Bouti would be targeted by a suicide bomber inside a mosque. “I don’t know of a single opposition group that could do something like this,” said Walid al-Bunni, a spokesman for the Syrian National Coalition opposition group, speaking on Al-Arabiya TV. Assad’s regime refers to the rebels fighting against it as “terrorists” and “mercenaries” who are backed by foreign powers trying to destabilize the country. The war, which the U.N. says has killed more than 70,000 people, has become increasingly chaotic as rebels press closer to Assad’s seat of power in Damascus after seizing large swaths of territory in the northern and eastern parts of the country. On Thursday, rebels captured a village and other territory on the edge of the Golan Heights as fighting closed in on the strategic plateau that Israel captured from Syria in 1967 and later annexed, activists and officials said. The battles near the town of Quneitra in southwest Syria sent many residents fleeing, including dozens who crossed into neighboring Lebanon. The fighting in the sensitive area began Wednesday near the cease-fire line between Syrian and Israeli troops. One of the worst-case scenarios for Syria’s civil war is that it could draw in neighboring countries such as Israel or Lebanon. There have already been clashes with Turkey, Syria’s neighbor to the north. And Israel recently bombed targets inside Syria said to include a weapons convoy headed for Hezbollah in Lebanon, a key ally of the Damascus regime and an arch-foe of the Jewish state. If the rebels take over the Quneitra region, it will bring radical Islamic militants to a front line with Israeli troops. The rebels are composed of dozens of groups, including the powerful al-Qaida-linked Jabhat al-Nusra, which the Obama administration labels a terrorist organization. Israel has said its policy is not to get involved in the Syrian civil war, but it has retaliated for sporadic Syrian fire that spilled over into Israeli communities on the Golan Heights. The Golan front has been mostly quiet since 1974, a year after Syria and Israel fought a war. The Britain-based activist group Syrian Observatory for Human Rights said rebels seized control of parts of villages a few miles (kilometers) from the cease-fire line with Israel after fierce fighting with regime forces. The Local Coordination Committees, another anti-regime activist group, reported heavy fighting in the nearby village of Sahm al-Golan and said rebels were attacking an army post. The Observatory said seven people, including three children, were killed Wednesday by government shelling of villages in the area. Rami Abdul-Rahman, who heads the Observatory, said the fighting around the town of Arnabeh intensified Thursday, a day after rebels captured it. He added that the rebels captured two nearby army posts. In Lebanon, security officials said 150 people, mostly women and children, walked for six hours in rugged mountains covered with snow to reach safety in the Lebanese border town of Chebaa. They said eight wounded Syrians were brought on mules from Beit Jan and taken in ambulances to hospitals in Chebaa. The officials, who spoke on condition of anonymity because they were not authorized to speak to the media, said the Syrians fled from the town of Beit Jan, near the Golan Heights. The Yarmouk Martyrs Brigade, a rebel group active in southern Syria, said in a statement on its Facebook page that its fighters stormed an army post between the villages of Sahm al-Golan and Shajara. The fighting moved closer to Israel as President Barack Obama was visiting the Jewish state for the first time since taking office more than four years ago.